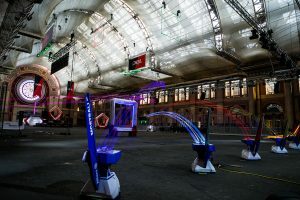 The Drone Racing League custom drone, the Racer3, in action at Alexandra Palace for the World Championship during the Drone Racing League Photocall at Alexandra Palace, London. PRESS ASSOCIATION Photo. Photo credit: Steve Paston/PA Wire. First person view (FPV) racing of small quadcopters is shifting from hobby into mainstream sport by blending the digital and physical worlds in a way no esport or traditional racing league can match. That’s according to Nicholas Horbaczewski, CEO/founder of the Drone Racing League (DRL), which recently secured a $20 million investment led by Sky and Liberty Media (owner of Formula One). However, although there is limited live streaming, FPV racing is a strictly post-produced action until the economics stack up for it to go live. Launched in January 2016 as the only global professional drone racing organization, DRL’s five races in the 2017 Allianz World Championship Season are broadcast on ESPN, and in more than 75 countries with partners including Sky Sports, ProSiebenSat.1, Disney XD and OSN. DRL designs and manages the entire drone racing and broadcast ecosystem for its events – everything from the drones and courses to the timing and length of the races to the capture and presentation of the sport. Racing quadcopters are small, fast and fly in all three dimensions, drastically increasing the challenge for camera operators (imagine trying to capture six golf balls driven at the same time in a wind storm). Since the sports world already has good access to many forms of racing, pure racing alone is not sufficient to engage a mainstream audience, reckons Horbaczewski. Therefore, DRL also capture the human and technology sides of each event to incorporate them into the final shows. The production typically deploys 50 to 60 cameras per event. In the remote production truck, DRL use 8-12 Grass Valley LDK 8000 Elite or LDX 86 Universe UHD-HDR Cameras (2-4 on jibs). It typically deploys one cable or rail cam and one Grass Valley Hi Speed 6x Camera on a remote robotic head run through the truck. It brings 23 Marshall CV345-CSB POV Cameras to each event (10-12 on the cockpit and audience, 1-2 through the truck in obscure locations on the course, and the rest throughout the course recording locally). Five Varicam LTs are used for interviews, behind the scenes, and talent stand-ups. Another two RED Epics capture dramatic drone footage. Each drone itself has two cameras: an SD low latency analogue HS1177 600TVL for pilot navigation, and a GoPro Session 5 for post production, both of which operate automatically with no remote controls. Finally, DRL deploy up to 10 GoPro Hero 4+/Black cameras on the course in unusual or otherwise precarious locations. The manned cameras are routed to the truck via triax, SMPTE and fibre. The switcher is a GVG Kayenne Elite 3G K-Frame HD Production Center. For the house feeds, fibre is used and then converted as needed depending on the destination source in the gallery (HDMI/SDI). Horbaczewski explains that the production record in four primary codec’s ranging from 4K down to HD resolutions. At any given event there are 16 to 22 cameras that run through the production truck and are recorded on SSD KiPro’s. Another 30+ unmanned POV style cameras supplement the course coverage. Those cameras are recorded either at the camera or brought back to multiple control points as dictated by the venue and camera positions. On top of this there are seven cinematic cameras providing a range of coverage all captured to in-camera cards and manually delivered to the media management station. All this generates about 250 hours of footage a day. Figuring out how to transfer that much data each day was a challenge, especially to achieve a cost-effective solution, live and within the RF limitations, and ensure that the footage ends up with a proper level of redundancy and verification. To achieve this, the production uses three full time people and gear including: SNS EVO 8 Bay Short Depth Storage Server; 2x R3 Thunderbolt 3 Promise Pegasus RAIDs; 3 x MacBook Pros; Sonnet 10G NIC Cards; and various card readers for the different camera sources. Depending on the size of the course there are 30-50 FX microphones throughout the venue. These are routed through the truck and then recorded on the various KiPros that are used for the video feeds of the manned truck cameras. Mics mounted to the POV cameras on the course and elsewhere are locally recorded at the camera. There are also 12-14 wireless microphones used on talent and drone pilots. These are recorded with ENG audio techs on portable multitrack recorders. The league’s key technical production partners include Ghost Hand Productions in Santa Cruz, CA, Lyon Video in Columbus, OH, Telegenic in Buckinghamshire, UK, NextGen RF Design in Waseca, MN, L3DFX in Bolingbrook, IL, Delicate Productions in Camarillo, CA. Post-production starts with media management, proxy creation, and heat alignments (aligning all 50+ cameras on a single Adobe Premiere for each heat including before and after the racing). One team refines the live line-cut, incorporating all the additional cameras as appropriate, and selecting replays/highlights. Another team reviews, selects and organises the non-race content. A third team starts building the overarching story arcs for each show. A fourth team works on features and animations. And a fifth team starts building the graphics by hand (it’s still more economical than automation at this point). Switching to 4K is primarily an economic question. 4K trucks are “drastically” more expensive than HD trucks, and the data management effort would have to expand significantly to handle the transfers within the available time on site. Swapping out 4K POV cameras is technically possible but expensive. There are similarities in first person game-play with esports – and DRL is exploring esports’ nature and quantity of on-screen data. DRL has already developed a realistic FPV drone flight simulator and video game that was used to qualify one of its pilots. As RF technology, processing speeds, and multi-screen distribution improves, the integration of video game features into real racing will continue.